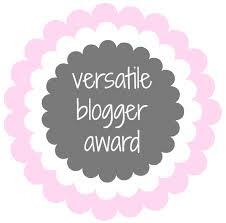 A huge thanks to Natalie from Intrepid Bliss for nominating me for the Versatile Blogger Award. Natalie is one of the most crafty, sweet and genuine bloggers I've come across, so please do go and check out her blog! 1. I have a college degree with a double major in English and Anthropology - and my work involves neither. 2. I am a morning person, I wake up at 7 am most weekends and I'm in bed by 10 at the latest. 3. I love horror movies. 4. I used to be a hoarder, but since moving at least once every one to two years since I was 18 I keep the bare minimum now. 5. My favorite drink is a Bloody Mary, but I dislike tomatoes. 6. I'll do my makeup everyday of the week but can't be bothered with my hair, so it's always a mess. 7. I wore glasses when I was younger, not because I needed them but because I was so shy I wouldn't tell the optometrist what letters I was seeing, so he believed that I couldn't see them. When he brought my mom back and I started telling him what letters I saw, he believed that was the correction I needed. It was so bad I couldn't see out of them, but my parents and teachers insisted I wear them believing I was just being vain. Andrea from Living on Cloud Nine : Literally my soul sister and the most beautiful, genuine person, her blog is full of fun fashion and yummy recipes! Ella from In Ella's Element : She does a lot of beauty bits but she also does advice/life lesson blogs that I absolutely love to read! Katie from Hello Katie Girl : Whether it's fashion, art or nature, Katie's pictures are outstanding. She always looks amazing in her fashion posts, this girl is literally my fashion inspiration! Rainbow from Rainbow-Rose Blossom : Rainbow is as unique and beautiful as her name, she writes posts that vary from inspirational writings to hair updates and I love each and every one! Clare from Clares Loves : Clare's blog is beautiful and we share a lot of the same beauty product loves, so you can be assured that I'm checking her blog for what she's liking! Tesle from Enchanted Escape : She's so cute, I love seeing her outfit photos but I really love seeing all the places she's going, where she's eating and what she is loving! Meghan from Simple Life Soliloquies : Man do I love Meghan's posts...she's so real and raw and inspiring, I absolutely love reading her musings on life! Patricia from dorigamii : I love Patricia's style, she so chic and classic and her wardrobe is essentially every basic I want to own in my closet! Kiki from color me kiki : I mean, could there be anyone cuter? I love Kiki's style, her blog is so colorful and fun and I love reading up on what she's been loving! Courtney from Eric and Courtney : This is the cutest family I've ever seen and I love keeping up with what they've got going on over on Courtney's blog! Sophia from St-Style : Sophia is one of the most creative, original bloggers I've come across. I love seeing her style posts, she's incredibly unique and I love the fun she has with fashion! Farihah from cutie pie frizzy : Farihah's product reviews are so in depth and informative, she's definitely one of my favorites when it comes to figuring out what I want to try out next! Candice from Beauty Candy Loves : Candice's blog is a recent discovery for me but I already love it; her beauty, fashion and lifestyle blog is right up my alley! Jennie Emma : Her beauty picks are always spot on, her photographs are gorgeous and I love catching up on all her posts! Heather from meadow and may : This blog is basically the life I wish I was living. From her recipes to her amazing crafts, I am seriously in love with this blog! Kim, could you be any more precious!!!! Just love ya! Thank you for your sweet words. I hear ya on the college degree, doing nothing with mine either but my two anthropology classes in college were two of my favs!!! Hope your week is off to an awesome start!!! :-) Hugs my friend!!! Thank you so much for nominating me Kim! You are such a lovely lady and I loved your facts I wish I was a morning person like you! Here is my post on the award, thank you so much again my lovely friend! Wow Anthropology, that is so badass! How long of study was that? Haha your last fact just made me giggle and smile, the things we do as children! You truly do have a golden heart lovely! <3 I can't wait to check all these wonderful bloggers out! Thank you for nominating me and writing such kind words about my blog, Kim! I love that you like Bloody Marys, but hate tomatoes...I have a bunch of weird food things like that too! Also, I wish I could be a morning person...I have to get up at 5:30 for work during the school year, so that would definitely help! Aw, thanks for nominating me! Such kind and undeserved words haha. I feel like I dress so plainly! I also definitely broke out of my hoarder phase when I was in college and moving every single year.